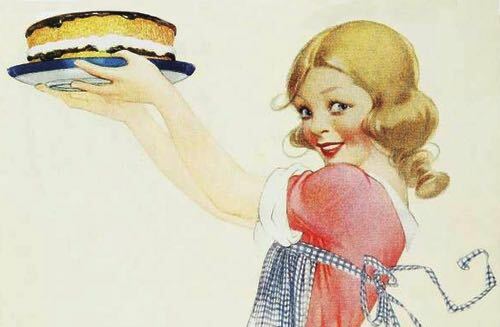 You will love these old fashioned dessert cake recipes. These cakes are easy to make, and they will always turn out absolutely delicious. 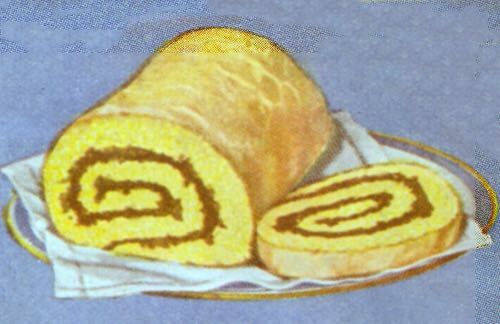 Choose one of the fancy layer cakes, the classic loaf cake, or try the scrumptious chocolate roll. These are always a joy to serve to family and guests. Cream 1/2 cup shortening; add 1-1/2 cups sugar slowly; add 2 beaten egg yolks. Sift together 3-1/2 teaspoons baking powder, 1/4 teaspoon salt, and 2-1/3 cups flour, and add alternately with 2/3 cup milk; add 1 teaspoon vanilla and fold in 2 beaten egg whites. 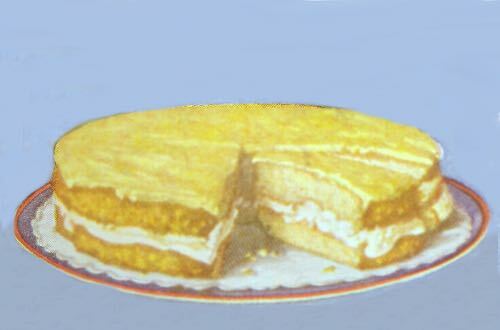 Bake in 3 greased layer cake tins in moderate oven (375°F) about 15 to 20 minutes, or until cake tests done with toothpick. This dessert cake recipe never fails to please. For filling and icing — Put 3 cups confectioner's sugar into bowl; add 1/4 cup milk and beat until smooth; add 1 tablespoon lemon juice and 1 tablespoon small pieces of canned pineapple; add 1 teaspoon melted butter. Spread between layers and sprinkle with additional small pieces of pineapple drained well. Spread icing on top and sides of cake and add pieces of the pineapple while icing is still soft. Cream 1/3 cup shortening; add 1 cup sugar slowly, beating well; add 1 beaten egg. Sift together 1-3/4 cups flour, 1/4 teaspoon salt, and 4 teaspoons baking powder and add alternately with 1 cup milk, a little at a time. 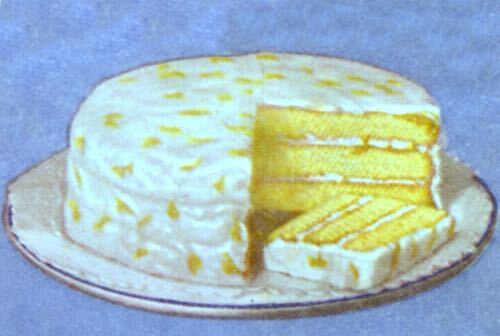 Add 1 teaspoon vanilla and bake in 2 greased layer cake tins in moderate oven (375°F) about 15 to 20 minutes. Spread 1 cup sweetened flavored whipped cream thickly between layers. 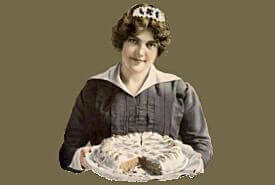 Cover top with orange frosting made with 1 cup confectioner's sugar added slowly to 1 tablespoon cream. Add pulp and grated rind of 1 orange, 1/2 teaspoon orange extract, and 1 teaspoon melted butter. 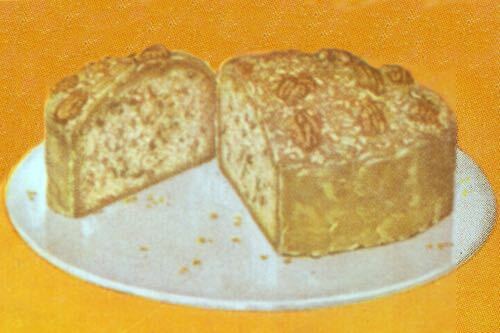 For this dessert cake recipe, cream 1/3 cup shortening with 1 cup light brown sugar; add 2 egg yolks; mix well and add 3/4 cup milk; sift together 1-1/2 cups flour, 1/2 teaspoon salt, and two teaspoons baking powder and add; mix in one cup finely chopped nuts — preferably pecans — and 1 teaspoon vanilla. Bake in greased loaf pan in moderate oven (375°F) about 35 minutes. Cover top and sides with maple icing as follows: add 1/2 teaspoon butter to 2 tablespoons hot milk; add 1-1/2 cups confectioner's sugar to make smooth paste; add 1/2 teaspoon maple flavoring and spread. Sprinkle with nuts while icing is still soft. Beat 2 egg yolks; add 1 cup sugar slowly and 4 tablespoons cold water. Sift 1 cup flour with 1-1/2 teaspoons baking powder and 1/2 teaspoon salt, and add alternately with 2 beaten egg whites. Spread very "thinly" on long greased pan. Bake in moderate oven (375°F) about 15 minutes. Turn out on damp cloth sprinkled with powdered sugar — trim hard edges; spread with filling and roll in cloth while still warm. When cool remove to plate and sprinkle with powdered sugar. For chocolate filling — Scald 1/4 cup milk with 1-1/2 squares melted unsweetened chocolate. Thicken with 1/4 cup flour mixed with 1/4 cup cold milk; add 1 tablespoon butter. Beat 1/2 cup sugar, 1 egg, and 1/4 teaspoon salt together and add. Cook over hot water until smooth and thick. Add 1/2 teaspoon vanilla and spread. For this homemade dessert cake recipe, cream 1/3 cup shortening with 1 cup sugar, beating well; add 1 beaten egg, 1 cup milk slowly, and mix well. Add 1-3/4 cups flour sifted with 1/4 teaspoon salt and 4 teaspoons baking powder; mix in 1 teaspoon vanilla and bake in 3 greased layer cake tins in moderate oven (375°F) about 15 to 20 minutes. 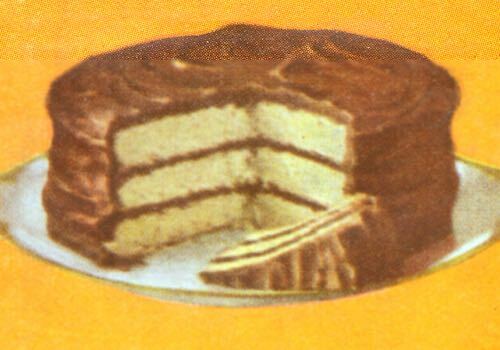 Put layers together with chocolate cake filling and icing made with 3 cups confectioner's sugar to which is added slowly sufficient boiling water to make smooth paste; add 1 teaspoon vanilla, 2 ounces unsweetened melted chocolate, and 1/2 teaspoonful grated orange peel. To begin this dessert cake recipe, line a 13x9-inch pan with some of the graham crackers, breaking crackers if necessary near the edges to evenly cover the pan's bottom. Pour cold milk into bowl. Add pudding mix. With mixer at low speed, beat until well blended (1 to 2 minutes). Let mixture stand 5 minutes, then carefully blend in whipped topping.